As there are a wide variety of industries where it’s beneficial to skim oil, there are also a wide variety of items, besides just the oil and water, which can end up in tanks, sumps, pits and ponds. Bottles, cans, cups, metal chips, safety glasses, ear plugs, leaves, sticks – just to name a few of the things we have seen in our 45 years in the industry. These items will float on the surface of the solution you’re trying to skim and wreak havoc for many types of oil skimmers out there, except one. 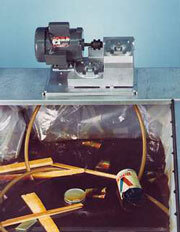 Many types of oil skimmers follow a fixed path. Belts, discs, drums, ropes and mops, for example, all cycle through the oil/water solution in the same spot with each pass. If you were to put a barrier in front of the surface of one of these skimming devices, you would prevent the oil from reaching the device and no oil would be skimmed. So, as described here, floating debris forms together and creates a dam, or barrier and renders these fixed path skimmers useless. In some cases, floating debris can get caught in the submerged elements, or between the pulley wheel and the belt of the skimmer, throwing it off track and requiring maintenance. With rope and mop skimmers, some debris, like metal chips, may be picked up along with the oil and end up in the oil collection tank, requiring further filtration before the oil can be reused or recycled. With debris causing so many issues for fixed path skimmers, how is the story different for the Model 5H and 6V? The key term here is free-floating. The tube on the Model 5H and 6V skimmers floats freely on top of the oil and is at no point submerged below the surface of the solution. Whether you have 5 or 15 feet of tube on the surface at any point, it moves randomly, not following any fixed path. Floating debris is no match for the collector tube as it easily snakes around and among debris, continuously picking up oil along the way. Since there is no fixed path for debris to block - and no submerged elements for debris to get caught up in - and it’s not made of a material that will pick up debris along with the oil - the free-floating collector tube continues to operate effectively and efficiently. For a thorough look at the issues discussed here and the many other challenges of removing oil, please read our whitepaper: The Challenges of Removing Surface (Free-Floating) Oil.